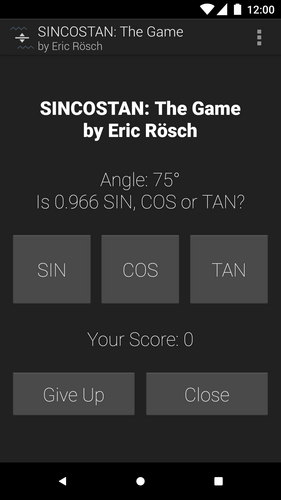 In SINCOSTAN The Game you will be given an angle (in degrees) and a number. 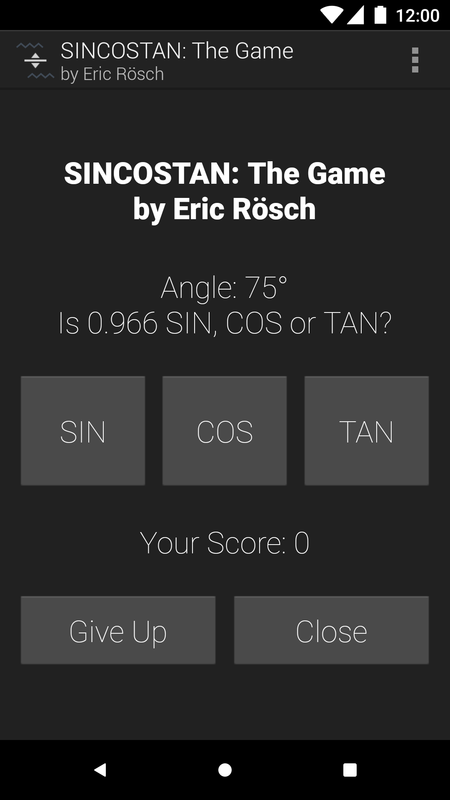 And you have to decide if the given number is the sine, cosine or tangent of that angle. Here's an example: The angle is 45° and the number is 1. Thus, the answer is TAN: tan(45) = 1. Once you choose the wrong answer, it's Game Over. Depending on how many rounds you got right, you'll be given one of eight ranks. When playing the Web version, you can either click on the buttons or press S, C or T on your keyboard to choose SIN, COS or TAN. You can also press R to restart the game. The Android version also has a leaderboard (local only) where you can see your best scores. The latest version is always available here, however if you want an older version all builds of the Android version can be found by launching it and choosing "Check for Updates" from the context menu and selecting "All Versions".